Practical and affordable is possible. Any of these baby shower favors will help you stay within your budget and will be useful for your guests long after the shower is over. Practical baby shower favors that are also affordable are a great combination, although they’re not always easy to find. Luckily, we happen to have some practical and reasonably price baby shower favors to recommend, and they won’t leave you breaking the bank or lead to a wasted investment. Any of these designs are sure to be enjoyed and used by your shower guests long after they return home from your shower occasion. If you have a budget to stick to and want to give your guests favors that are worthwhile, these practical baby shower favors can’t be beat. These slide mint tins have baby-themed designs, but they are reusable, so your guests can use them again and again as they refill them with their favorite mints or candies. They come in pink or blue with striped baby designs and are available for as low as $1.50. They provide great practical baby shower favors to moms on a budget. This is one of our absolute favorite baby shower favors to recommend when expectant moms come to us asking for practical, affordable baby shower favors. These cheese graters are available for as low as $1.83 each, they are unique and thoughtful, and they can be used in the kitchen for years and years to come. They come packaged with a cute mom-design cutout, complete with white organza bow and “For You” tag. These practical baby shower favors won’t break the bank, but they’ll definitely impress your guests. 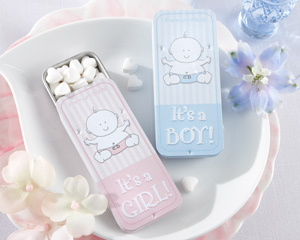 This entry was posted in Affordable Baby Favors, Practical Baby Favors and tagged boy favors, girl favors. Bookmark the permalink.